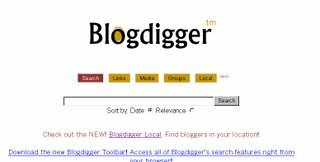 Blogdigger is a blog search engine. Its search feature including blog search, media, groups, links, and local search. Media search including MP3,Windows media, and Quick time files. Very useful!